rose grew up in the seattle area, and began studying the violin at the age of 11. she is currently a member of the bellevue philharmonic and bellevue opera orchestras and has also played with such local orchestras as rainier symphony and the seattle choral company. in addition to performing, rose is on the music faculty at holy names academy and maintains a private studio as well. when she is not performing or teaching, rose enjoys spending time outdoors, doing anything from hiking to rock climbing. ellen began studying the cello at the age of 11 after imagining how nice the cello would be to hold and what a wonderful dance partner it would make. things turned out just as they had seemed; the two have been together ever since. she has been performing, teaching and coaching in the greater seattle area for the past ten years, enjoying every bit of it. 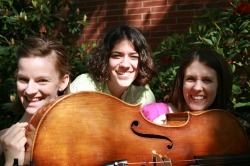 she has a special love for chamber music, as she has since the beginning of her cello career. she finds it to be among the greatest of privileges to be able to play with such a fabulous group of musicians and friends. when not in rehearsal, she can be found teaching in her private studio, climbing, slacklining, or spending time with the people she loves. alyssa is a full-time musician in the seattle area. maintaining a private teaching studio, working as a staff accompanist at seattle pacific university, and frequently freelancing keeps her on her toes. alyssa is a classically trained violinist as well as pianist, and in addition to her own artistic endeavors in this area, she enjoys working for cascade youth symphony as a coach for the sinfonette & premiere orchestras. alyssa is a native of phoenix, arizona and finds great satisfaction in each glorious ray of northwest sunshine! in between performances, sprezzatura is regularly found playing music for special events all around seattle and surrounding areas.